In Ohio, title to real property can be transferred from one party to another by executing a general warranty deed. A general warranty deed conveys fee simple interest in real property to the named grantee with the most assurance of title. 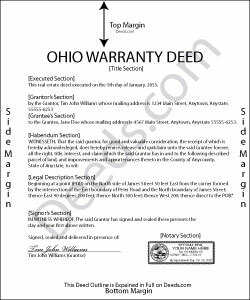 General warranty deeds are statutory in Ohio under Ohio Rev. Code Section 5302.05. When a deed is in this form and contains the specific language "with general warranty covenants," the implied covenants warrant that the grantor holds title to the property and has good right to convey it; that the property is free from encumbrances (with the exception of any noted in the deed); and that the grantor will defend the title against all lawful claims (Ohio Rev. Code Section 5302.05). General warranty deeds offer the highest level of protection for grantees (buyers). This warranty of title is greater than that of a limited or special warranty deed, which guarantees the title only against claims that arose during the time the grantor held title to the property, or a quitclaim deed, which offers no warranties of title. A lawful general warranty deed includes the grantor's full name, mailing address, and marital status; the statement "for valuable consideration paid"; and the grantee's full name, mailing address, marital status, and vesting. Vesting describes how the grantee holds title to the property. Generally, real property is owned in either sole ownership or in co-ownership. For Ohio residential property, the primary methods for holding title in co-ownership are tenancy in common and survivorship tenancy. An estate conveyed to two or more people is considered a tenancy in common, unless a survivorship tenancy is declared (Ohio Rev. Code Section 5302.20(a)). As with any conveyance of realty, general warranty deeds require a complete legal description of the parcel. Contact the county auditor to verify the legal description prior to recording. In Ohio, any deeds that modify a legal description or contain a new legal description require the name and address of the surveyor who created the legal description (Ohio Rev. Code Section 5301.25(B)). All new metes and bounds descriptions prepared by a registered surveyor must be accompanied by a signed and sealed plat of survey. Ohio law requires deeds to include a reference to the instrument granting title to the current grantor (Ohio Rev. Code Section 5301.011). That document's volume and page or instrument number should appear on the face of the deed, as well as the county where the document is filed. Ohio recognizes dower rights, which means that if a married man or woman owns an interest in real property, his or her spouse automatically holds a 1/3 interest in property, unless they have relinquished or been barred from it (Ohio Rev. Code Section 2103.02). As such, if the grantor is married, the spouse must join the deed to give up his or her dower rights. If applicable, the spouse's name should appear on the face of the deed. Consult a lawyer with questions regarding dower rights and release. Detail any restrictions associated with the property and sign the deed in the presence of a notary public or other authorized official. Submit the deed to the appropriate county auditor's office prior to recording so that the owner's name can be transferred on the county's tax list (Ohio Rev. Code Section 319.20). Record the deed at the recorder's office in the county where the property is located for a valid transfer. Contact the same office to confirm accepted forms of payment. A Conveyance Fee Statement (Form DTE 100, or DTE 100EX if claiming an exemption) must be signed by the grantee and filed with the deed. This article is provided for informational purposes only and is not a substitute for legal advice. Contact an attorney with questions related to statutory warranty deeds or for any other issues related to the transfer of real property in Ohio. Reply from Staff: Thank you Mary. Cynthia S. said: Good find, provides guide to use. chungming a. said: easy to use website. Maurice B. said: The program fields should allow the customer to change font size and allow additional space for information to be place on the Deed. Not Bad, still needs improvement. Reply from Staff: Thank you for your feedback Maurice. Unfortunately we do not make the requirements for things like font size and margins, we only make the documents to be compliant with them.